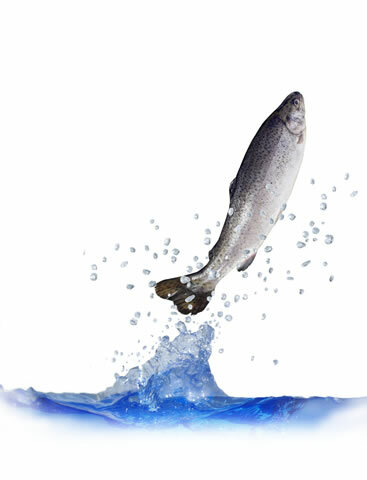 Research has shown that the tastiest of fresh water fish, trout, is also rich in vitamins, iodine and phosphorous. Trout also has a high protein value compared to other edible fresh water fish. According to research by expert nutritionists, Omega-3 fats can lower the level of cholestorel and lead to more efficient working of the heart and arteries. To feel the effects of Omega-3 fats in protecting the heart and arteries, you need to consume 100g of fish per day for 6 weeks. The European Union’s expert nutritionist, Doctor Artemis Simopoulos, says that not only do Omega fats strengthen the body’s immune system against infections, but they also help develop the brain and cells, in fact “If you want to slow down the effects of ageing you need to increase your consumption of Omega-3” she says. Dr. Simopoulos adds "In a piece of research carried out in Italy, 1 gram of fish oil was added to the normal Italian diet, and the recipients showed a significant drop in fatality due to heart attacks. İt has also been shown that in countries where more fish is eaten, recorded cases of depression are far fewer.” Dr. Simopoulos emphasises that people over the age of 65 need to eat more fish. Research has also shown that a deficiency of Omega-3 fats is linked to low levels of serotonin in the blood. As serotonin has a proven effect on feelings of happiness, its lack may lead to depression, hence the connection between not eating enough fish and suffering from depression. Countries such as New Zealand, Canada and Germany where Omega-3 consumption is low, have around 5% of the population suffering from depression; in Japan and Taiwan, countries where sufficient Omega-3 is consumed, the percentage affected by depression falls to a mere 1%. A piece of research carried out with 44 depressed people in America, involved them consuming 100g of fish oil daily for four months, at the end of which all 44 reported their depression had lessened. According to another research project, a high level of Dha (one of the Omega-3 fatty acids) in the blood, leads to higher levels of serotonin in the brain. The link between serotonin and feelings of ‘relaxation and happiness’ is an important neural conductor. Research carried out in 11 countries has shown that there is an inverse correlation between the incidence of depression and the consumption of fish. Another piece of research conducted in America and involving 80,000 nurses followed over 12 years, showed that those who ate fish once per week reduced their incidence of heart attacks by 22%, compared to those who only ate fish once per month. According to experts eating fish five times per week halves the risk of a heart attack. Recently published research in Australia has proved that there is a definite link between nutrition and skin ageing. This work showed that those who ate large quantities of vegetables, olive oil and fish had skin that seemed younger, and wrinkles that had appeared later in life than the norm. Trout is a great help to people trying to lose weight. 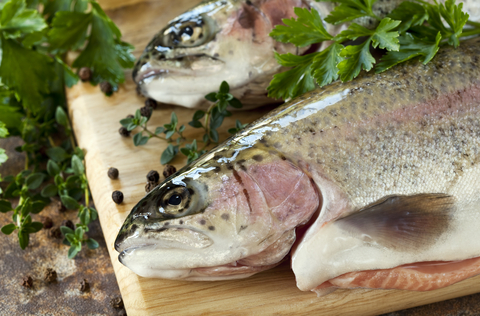 100 gram of trout contains a mere 86 calories. 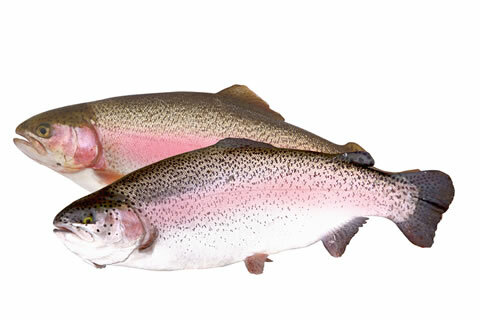 Trout comprises 80.5% water, 47.7% protein, 3% fat. As it is so low in fat this fresh water fish is also good for people with cholesterol problems. They should eat the fish steamed. This will remove even more fat and make the fish more easily digestible. Two fillets of steamed trout (200g) dressed with olive oil and lemon, and served alongside two boiled potatoes and a tomato, provides a nourishing meal of only 400 calories. Fatty acids found in fish contribute to the body’s energy sources. These fatty acids, attached to the body's oxygen, bring about the transfer of electrons and create energy for other chemical processes within the body. There has been scientific investigation of the relationship between fish oil and the concept of increasing the body's strength and capacity for work. Consumers of Omega-3 have been shown to have higher energy levels and to be better at concentrating. There is a basis of scientific evidence that fish is good for the brain, as the main chemical component of fat found in the brain is DHA, which is also found in Omega-3 fatty acids. Fish oil contains two important types of polyunsaturated fatty acids very important for our health: EPA (eicosapentaenoic acid) and DHA (docosahexaenoic acid). EPA and DHA are known as polyunsaturated fats and are important elements within Omega-3 fatty acids. The human body does not make its own Omega-3 and Omega-6 fatty acids so they have to be introduced with food. For this reason, as it contains these fatty acids which are vital for the body, fish is one of the best forms of nutrition. The Omega-3 fatty acid found in fish has a beneficial effect on blood cholesterol, triglycerides, it can help lower blood pressure and contribute to a healthy heart. Triglycerides are a mechanism for storing unused calories and their high concentration in blood correlates with the consumption of starchy and other high carbohydrate foods, and can indicate an increased risk of heart disease. Indeed, fish oil has also been shown to be beneficial following a heart attack, when it helps reduce life-threatening abnormal heart rhythms. Research carried out by the American Medical Association, in which a sample of women ate fish five times per week, showed that the sample's risk of heart attack was reduced by one third. This would seem to be due to the role of the Omega-3 fatty acids found in fish oil, which reduce the incidence of blood clots. The blood in our arteries normally flows at a rate of 60km per hour and this rate of flow is vital for life. The greatest threat to this flow – apart from uncontrolled bleeding – is the slowing down of blood flow due to clotting. It has also been shown that fish oil lessens the chances of thrombosis (when platelets within the blood coagulate during the normal flow around the body) occurring. Another cause of clotting is the narrowing of the arteries. When this happens the heart, brain, kidneys and all other organs of the body do not receive sufficient blood and, at times of stress, or in due course at any time, death can occur. When an artery is clotted with blood it can cause a heart attack or paralysis amongst many other effects. Omega-3 fatty acids play a major role in the production of haemoglobin molecules which carry oxygen in red blood cells and control nutrition via cell membranes, hence protecting the body from harmful fats. The role of Omega-3 fatty acids with regard to the brain and retinas, and the linkage with the needs of new born babies, has become an important research subject over the past ten years. This has revealed significant evidence for the the importance of Omega-3 in foetus development while the baby is still in its mother's womb, a role which continues within the development of new born infants. Throughout pregnancy and in the early stages of new born life, Omega-3 is crucial to the development of the brain and nervous system. Hence breastfeeding is a natural way to ensure Omega-3 is passed from mother to child. The biggest risk with rheumatoid arthritis (an infection in the arteries linked to rheumatism) is that irreversible erosion of the joints will take place. In such cases it has been proved that Omega-3 fatty acids can be a vital part of diet, fighting arthritis and lessening swelling and pain in joints. There has been a multiplicity of research into the beneficial effects of Omega-3 fatty acids on the healthy function of the brain and nervous system. It has also been shown that fish oil can have a positive effect in cases of depression, Alzheimer's disease and even schizophrenia. For example, patients suffering from depression were given a daily dose of 1 gram of Omega-3 fatty acid over a period of 12 weeks, and all noted a decrease in anxiety and a reduction in sleeping problems. • Lupus (skin disease which starts from skin wounds). • Osteoporosis (leads to fragile, brittle bones) and diabetes. • Treatment of burns and skin problems in general.